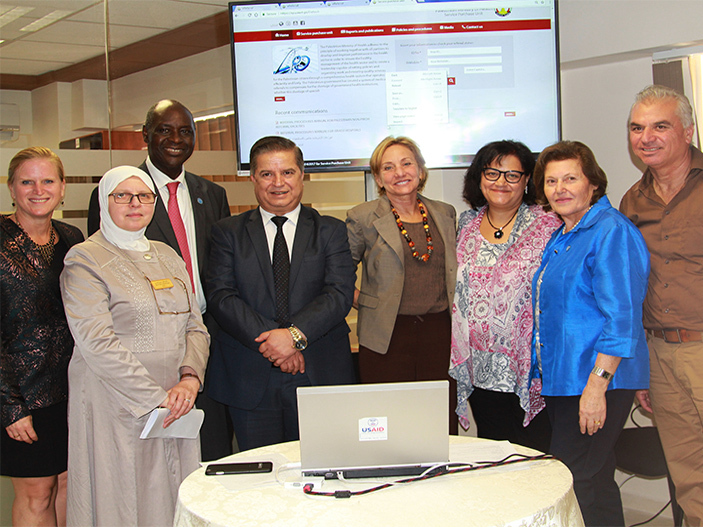 IntraHealth International’s president Pape Gaye (third from left), Palestinian Minister of Health Dr. Jawad Awwad (fourth from left), USAID West Bank and Gaza Mission Director Monica Stein-Olson (fifth from left), IntraHealth's Chief of Party for the Palestinian Health Capacity Project Salwa Bitar (second from right), and others at the launch of the eReferral system in August. Photo by Jihad Mashal for IntraHealth International. Last month, the Palestinian Ministry of Health launched a new electronic medical referral system and opened its first Customer Service Centers. These efforts will help the ministry streamline referral processes, improve client experience, and ultimately increase access to specialty care for Palestinians. The Palestinian Health Capacity Project, led by IntraHealth International and funded by USAID, helped the ministry design and roll out these innovations. The ministry serves approximately 4.6 million people living in the West Bank and Gaza. When clients need specialized care that is not available within the Palestinian health sector, the ministry refers them to private or NGO-managed facilities in the West Bank and East Jerusalem, or abroad—mostly in Israel. Over the last 15 years the number of medical referrals skyrocketed from 8,000 to 62,000 per year, and became a challenge for the ministry to manage and finance. In 2014, the annual cost of referrals peaked at $100 million. Since 2014, IntraHealth has been helping the ministry reform its referral system, including establishing an official communication pathway with referral hospitals, defining referral eligibility protocols, standardizing referral approvals and processing, and negotiating agreements with referral hospitals on better prices for certain medical services, admissions processes, and invoicing. So far these efforts have led to dramatic improvements in the overall appropriateness of referrals (those that follow the newly defined eligibility protocol rose from 41% to 88% in 2016) and a 30% decrease in overall referral costs in 2015 and 2016 (compared to 2014). To further streamline the cumbersome paper-based process and minimize delays in accessing much-needed care, the project helped the ministry develop and pilot an electronic medical referral system. In mid-August, the ministry began to scale up its "eReferral” web application—it went live at 12 ministry hospitals and will soon be made available at more than 40 referral facilities in the West Bank and Israel. The new eReferral system will ensure information about referral authorizations, medical procedures, follow up, and invoicing can be easily tracked, approved, or shared as needed by all stakeholders, including officials at the originating public hospitals, the ministry’s Service Purchase Unit, and referral facilities, as well as patients. The system will also produce regular reports to provide data to ministry decision-makers to inform future referral planning. On August 23, the Palestinian Ministry of Health opened its first Customer Service Centers in three government hospitals and at the ministry’s Service Purchase Unit, which oversees the referral process. The new centers will provide a comfortable atmosphere for clients to meet face-to-face with ministry staff to initiate new referral requests, check the status of existing referrals, and receive timely answers to questions. The Palestinian Health Capacity Project provided equipment and furniture for the center and created training materials, job descriptions, protocols, and procedures. The Customer Service Centers will also provide clients with access to the eReferral system—they can log in themselves using their ID number. Clients can provide in-person feedback on the new system and the specialty services they receive. Prior to the ministry engaging with the project, no standardized criteria existed for issuing or approving medical referrals, and decisions largely depended on individual judgement. That meant the ministry had no way to predict or control costs, and the process, processing time, and quality of the referrals were inconsistent. Together the ministry and the project have increased the appropriateness and financial regulation of referrals. And now, with these two additional innovations, aim to increase patient knowledge about referrals and decrease the time it takes to process and approve them.